THE VOTE If Man Utd sign Carlos Tevez, is the title in the bag? Football’s hottest rumour of the day is that Man Utd are closing in on the signing of Carlos Tevez. BBC sports editor Mihir Bose ‘understands talks are underway and says Tevez may move on loan or permanently’. I’d love to see Tevez stay in the Premiership, and I’d imagine West Ham fans, deep down, would love to see him have another full season in England. But how damn scary would Man Yoo’s squad be with Tevez in it? Answer: scarier than The Exorcist. With Tevez and Ronaldo causing havoc on the flanks and Rooney in the middle, I wouldn’t want to be a defender going to Old Trafford any time soon. If Tevez does sign for Man Yoo, are the champions’ title rivals playing for second? Could also do with another right-back . With a bit of work(ok, maybe a lot) there could be some use for Darren Fletcher and Kieran Richardson yet. Errghh have u missed the real hyp or something????? Tevez is not a Man U player yet!!!! He still belongs to West Ham and the transfer only goes through if the hammers agree to the lousy 20 million. West Ham said the player was not for sale and they have rejected a number of offers much higher all ready!! People just jump 2 conclusions, West Ham will reject and Tevez will stay where he belongs. Come on you Irons!!!! We’ll get Europe next year!!!!!! Just remember that no one thought they’d win the title last season. Chelsea were surely going to be champions with the signings of Kalou, Mikel, Ballack, Sheva, and Boulharouz. And look how that turned out. Just remember that Chelsea are still a quality side with players who just haven’t adjusted yet. Liverpool have time to spend money. Arsenal seem to have addressed their only glaring problem, which is a guy to put away all the chances they create, and a fit first team looks like one of the best in Europe in terms of talent. Teams are going to raise their game against Man Utd now as well. And I can’t help but feel that they have a soft underbelly in midfield and defence that will be exploited more next season. Tevez doesn’t help the Man Utd. Cause as much as others could. 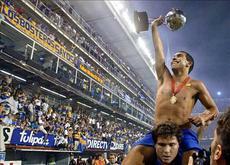 They will hoist the Premiership title next year, but not souly because of the signing of Carlos Tevez. If they do sign Tevez, I don’t like the signing very much. The transfer fee would be 20M Pounds our more, and watching the Hammers, Tevez = Rooney. A clutch flamboyant, strong forward, who isn’t a “fantastic” goalscorer. But if SAF is just trying to acquire a fresh Rooney to bring on in the 65th minute of a game against Chelsea, he won’t be disappointed with Tevez. This is not a run at the Premiership by SAF, its a run at the Champions League. In my opinion, I would rather see Man Utd. sign a guy like Nickolas Anelka, or a few weeks ago Darren Bent. Both are specifically goalscorers, which are vital in key stages of the Champions League. Bent has little experience which could be a problem, but Anelka has been there and done that. Anelka would also cost half the price of Tevez, despite the fact he is much older. If Man Utd. sign Tevez, they are stockpiling for the future, but I firmly believe he is not worth the 20M Pound transfer fee. will shine with players who are thinking what they are going to do after they retire!!!!! so get your records straight bleustilton person United are bringing the CL home this season!!! !